For people who work either occasionally or frequently from home, it can get a bit lonely staring at the computer screen all day. A feeling of isolation can set in, not to mention a serious lack of other living and breathing human beings to bounce ideas off of. To combat this problem remote office workers face, a new kind of workspace environment is cropping up all over. 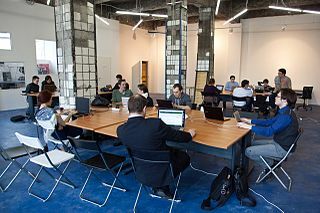 Co-working spaces are places where people come with their laptops to connect to the internet using the spaces WiFi connection, and to also connect to other people. “It’s beautiful… just a great, cosy, comfy, nice spot,” Donegan declared. WorkTable users receive a space in the “office” with WiFi, plus the company of other “co-workers” for a $30 fee per day. For 5 days in the same month the user will only pay $125 and for an entire month the fee comes down to $195. Donegan, and the second co-owner Mike Rozinsky, both from Marblehead, would like to see this space become a place where creativity can sprout through networking and where people can share their ideas and advice. Donegan and Rozinsky would like to eventually offer free lunch and special events. They would like to see members form business relationships which will create a WorkTable community. The space will be open to the public as of the week of May 4, from 9am to 5pm. It has not been decided yet which days of the week WorkTable will be open. Rozinsky and Donegan are both gainfully employed elsewhere, so they are looking for a third person to manage the space, supervise operations, and create a social media presence.